We all knew it was coming. 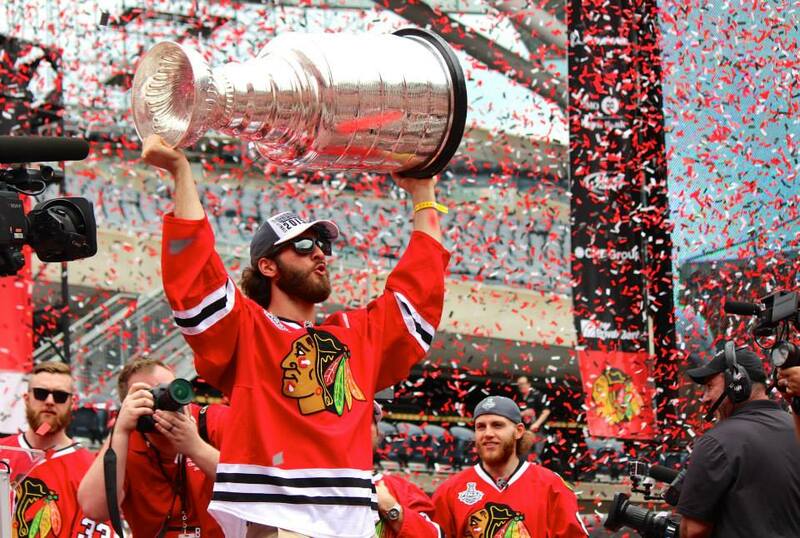 The Blackhawks were going to break up the championship team due to the cursed salary cap. No one thought it would begin though with trading one of its youngest stars, Brandon Saad, to the Columbus Blue Jackets. The Blackhawks traded Saad, along with minor league defenseman, Michael Paliotta and forward Alex Broadhurst for forwards Artem Anisimov, Jeremy Morin, Corey Tropp and Marko Dano, and a fourth-round pick in the 2016 NHL Draft. The two key players that the Blackhawks get in return are Anisimov and Dano. Anisimov is a 27yr. old, 6ft 4in, 200 lb. center that the Blackhawks have lacked for many years. 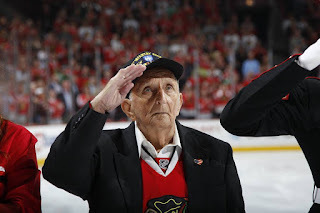 A big center that plays a 2-way game, that Stan Bowman has high regards for. With the signing of Anisimov, Vermette and possibly Richards may not be back in Chicago next year. Dano is a 20 yr. old, 1st round pick of the Bluejackets in 2013. He debuted last year and in 35 games had 21 points. For being so young, he plays a very good defensive game (something that Quenneville thrives on from his players). The puzzling piece of this trade is the return of Morin. He was always in Quenneville's doghouse for multiple reasons. Morin had some parting shots at the Blackhawks organization about ice time. Now he finds himself back again. One wonders that if Bryan Bickell can be traded, Morin would slip into his spot. Both players would replace the other when not in Quenneville's doghouse. Time will tell what other events will happen before opening night in October, but Blackhawk fans are feeling the pains once again of what the salary cap does to a good team. Don't jump off the ledge yet, this isn't as bad as it seems. Bowman's track record has been amazing for rebuilding this franchise while still being incredibly competitive. The core is still intact (Toews, Kane, Keith, Hossa, Seabrook, Crawford). 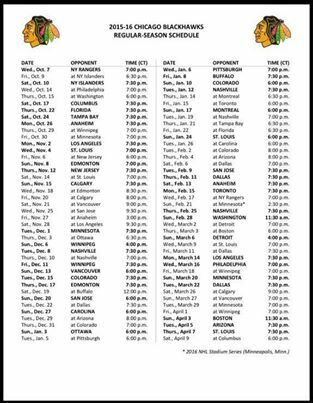 The NHL released the 2015-16 schedule this season. The Blackhawks will kick off their season with a banner raising game on October 7th, against the New York Rangers. As always, there are two long road trips throughout the year. This year the 'Hawks will have a 6-game road trip 11/18 - 11/28 as part of a stretch where they play 8 out of 10 games on the road. Their other road trip last is split between 1/14-2/6 where they play 9 out of 11 games on the road. Mark your calendars everyone!! October will be here sooner than we think (but never soon enough). The NHL Board of Governors approved some new rules for the upcoming 2015-16 NHL season. I believe one was needed, the other will bring a lot more excitement to the game. The first change is that of the overtime format. As regulation is a 5-on-5 format, overtime was reduced to a 4-on-4 format for the start of the 1999-2000 season. It was an attempt to reduce the chance of a game ending in a tie with having more open ice and more room for the chance to score the game winning goal in overtime. Six years later, the shootout was introduced as games were still ending in overtime as a tie. The shootout over the last few years has had its share of scrutiny. So, 3-on-3 hockey will be implemented during the 5 minute overtime period. In my opinion, I think this is a great move for the NHL. On a rare occurrence in overtime, there will be offsetting penalties to bring the 4-on-4 down to a 3-on-3. From what little I've seen, it's a great opportunity with a huge amount of ice for teams to throw out their star players who are fast and can create opportunities for scoring chances. Whether a team goes with two forwards and one defenseman on the ice or one forward and two defenseman, that will be the coaches call. 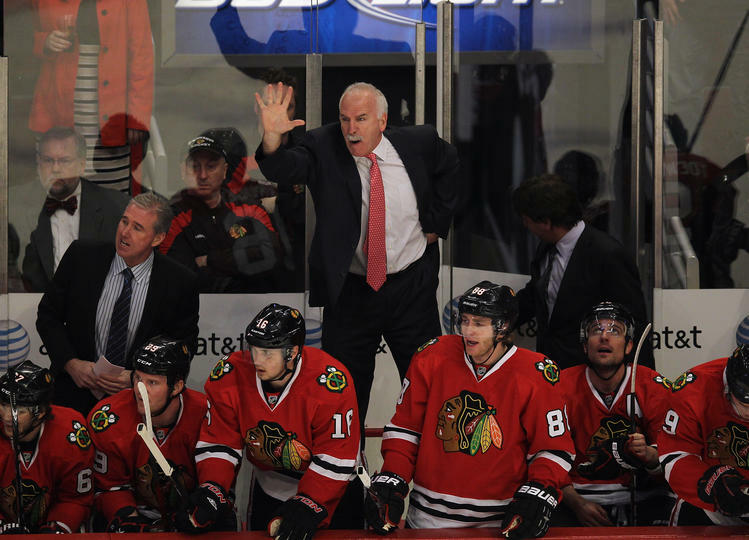 Honestly, with the firepower that the Blackhawks have, Coach Q can throw two lines of horror at any team, (Toews,Kane,Keith), (Hossa, Saad, Seabrook). You could also throw Teravainen in the mix as well. I'm REALLY looking forward to that. The other change is the coaches challenge. This is a needed addition since there have been the rare times where an apparent offside, leads to a goal. A review can be made by the head coach to reverse that now. If a coach challenges and loses, that team will lose their one and only timeout. This has happened a few different times dating back to the last few years in the playoffs where it is more relevant as teams play a more defensive game in the playoffs. 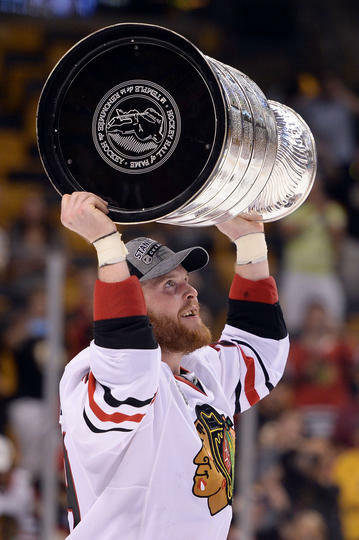 Stan Bowman's Stanley Cup celebration is once again short-lived, as he must deal with working on next year's roster to fit under the salary cap for the 2015-16 year. The cap has been set at $71.4 million. Currently, according to Spotrac.com, there is a mere $6.7 million available to work with. That will do very little if there are thoughts of resigning any of the unrestricted free agents (Carcillo, Desjardins, Oduya, Richards, Rozsival or Vermette). There is also the signing of restricted free agents, Marcus Kruger, Joakim Nordstrom and most importantly, Brandon Saad. Both, Bowman and Saad, have stated they are eager to get a contract done. Which then leads to, what moves need to be made in order to make room for next year's roster? Odds are, with the NHL draft coming up at the end of the week, two names, if moved, could clear nearly $10 million off the books. Patrick Sharp and Bryan Bickell. Though both had subpar years in 2014-15, the thought of moving both of these players for draft picks, (The Blackhawks don't have a 1st or 2nd round pick in this year's draft), would make sense. The trade deadline was fast and furious due to the unfortunate/fortunate injury to Patrick Kane. Kane was placed on injured reserve, which freed up valuable cap space for two deals. The Blackhawks traded their 1st round pick and defenseman prospect Klas Dahlbeck for Antoine Vermette. The Blackhawks also traded their 2nd round pick in 2015 & 2016 for Kimmo Timonen. Both were steep prices, as both of their deals ended at the end of this year, but Bowman was in it to win now, and it paid off. 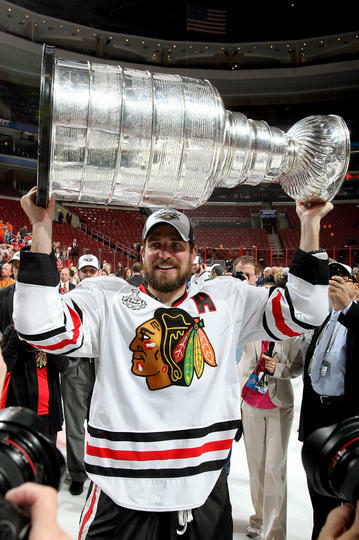 Rumors have the Washington Capitals and Florida Panthers interested in Patrick Sharp, while the Arizona Coyotes seem to have interests in Bryan Bickell. Both have 2 years remaining on their current deals. So what does Stan Bowman have up his sleeve? The dismantle of this team does not seem to be as feared as the 2010 Cup winning team where nearly half of the team did not return the following year. We will wait and see. Either way, Bowman will make the necessary moves to keep this team competitive next year, and for years to come.